It is my great pleasure and distinct honor to host the third edition of the Carnival of Trust, conceived and launched recently by Charles H. Green of Trusted Advisor Associates. Charlie contacted me by email a few months ago with a great idea for a new blog carnival of trust-related commentary gleaned from weblogs, not just in the sense of his book, The Trusted Advisor, and his blog, Trust Matters, but touching on a wider range of topics under the rubric of trust. His concept intrigued me -- a monthly blog carnival where selected hosts feature ten of the most interesting blog posts they can find related to trust. Charlie wanted to host the first and second presentations of the Carnival of Trust himself, before trusting anyone else to have a turn hosting. As I wrote here at the time, it was quite a surprise when one of the authors of a book titled The Trusted Advisor turned to me for advice how to manage a blog carnival. It must be the cologne I'm wearing. Anyway, now that I have your rapt attention, let's get to my selections for this third edition of the Carnival of Trust. "Many firms claim that what distinguishes their organization is that their people are client centric and act like trusted advisors. However, few of these organizations, when they hire, have programs to select for people who have basic friendship attitudes and skills and few have systematic programs to help their people develop them," writes David Maister (co-author of the book, The Trusted Advisor) at his business blog, Passion, People and Principles. "We accept that trust is a key enabler of efficient and productive working relationships. We’re less sure about what it means to say we trust someone and even more perplexed by what it takes to engender trust," writes Jay Gordon Cone of Interaction Associates. "When we go into the office in the morning, we do so trusting that we'll be safe there -- maybe not from professional upsets and personal knocks, but physically safe," writes Maureen Rogers in a compelling story of workplace violence at Pink Slip. The New Oxford American Dictionary lists trust as: firm belief in the reliability, truth, ability, or strength of someone. "Think about it…aren’t these the qualities you want in your business relationships? So do your clients. So how can you build greater trust with your target audience?" asks Dawud Miracle, who answers this question in a link-rich post titled "Are You Building Trust With Your Target Audience?" Trust is invisible, but the symptoms of its absence are not. That is the theme of this week's column at Sticky Minds, in which Clarke Ching recounts the difficulty one of his clients went through to rebuild trust with a customer. Michael Zimmer is a Post-Doctoral Associate in Law at Yale Law School. His research interests include social, political, and ethical dimensions of information and communication technologies, web search engines, and privacy and surveillance theory. On his eponymous blog, Zimmer exposes the emperor with no clothes in a post titled: Google’s Chief Privacy Counsel: "Don’t trust fat businessmen." Charles Green, at Trust Matters, asks, "Does Trust Drive the Dow?" Speaking on CBS News' Face the Nation program, Senator Patrick Leahy (D-VT) gave Attorney General Alberto Gonzales one week to resolve perceived inconsistencies in his testimonies, saying, (as reported by the Jurist weblog) "...he answered under oath at great length. I think a lot of us, Republicans and Democrats, were incredulous at some of the answers. I told him, frankly, I don't trust him." "Watching the media cover marijuana is fascinating, offering deep insight into conventional wisdom, bias and failure to properly place science in context. The coverage of a new study claiming that marijuana increases the risk of later psychotic illnesses like schizophrenia by 40% displays many of these flaws," writes Maia Szalavitz in an article headlined "Reefer Inanity: Never Trust the Media on Pot" on HuffPo. The mysterious writer has used his blog, the Secret Diary of Steve Jobs, to lampoon Mr. Jobs and his reputation as a difficult and egotistical leader, as well as to skewer other high-tech companies, tech journalists, venture capitalists, open-source software fanatics and Silicon Valley’s overall aura of excess. Damn, I am so busted, yo. 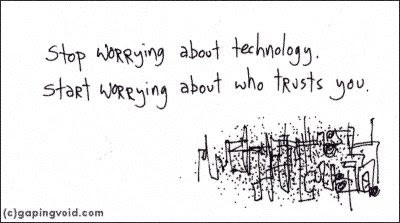 And the final word on trust, from one of my most trusted advisors, Hugh MacLeod. Technorati Chart showing the number of posts per day for the last 90 days that contain Blawg Review.